From the approaching drive off Gallagher Drive in Sherman, the complex looks like a series of pavilions linked one after another, each standing proud. Its elaborate composition may not be instantly meaningful to the passer-by, but upon touring the building one gains an understanding that this school, unlike many of its predecessors, has lofty intentions. While schools of the past drew their forms from classical details, and schools of our more recent past boast low-slung classroom wings with little architectural articulation and few windows, the new generation of schools makes natural light, views to the exterior and generous open spaces its inspiration. 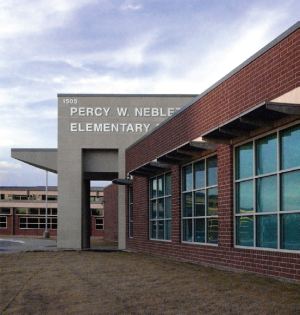 Neblett Elementary is part of a building campaign that includes two other schools, Sory Elementary and Washington Elementary. “Many of our teachers choose to leave their lights off all the time. In fact, in my room I choose to leave the lights off because the natural light is so calming,” reflected Dr. Sheryl Barnett, Principal of Washington Elementary. All the faculty and students are excited and illuminated by their new environment. The Neblett School offers clear lessons in environmental stewardship while lending quiet support to the daily bustle of school life. Editor’s Note: A clerestory (pronounced clear story) is a high wall with a band of narrow windows along the very top. The clerestory wall usually rises above adjoining roofs. Originally, the word clerestory referred to the upper level of a church or cathedral.